Why Was the 1933 Confiscation of Gold A “Good Thing”? QUESTION: Why was the confiscation of gold by FDR in 1933 a good thing? ANSWER: What you have to understand is that Franklin Delano Roosevelt’s (FDR) actions in 1933 were not directed simply at gold. This was the end of austerity, which is what was creating the serious economic depression. So, you must separate gold and the devaluation of the dollar to comprehend what the issue was all about. FDR could have simply abandoned the gold standard, as did Britain, and not confiscated gold, which would have also been sufficient to end austerity. But the bankers would have profited and sold the gold overseas at higher prices. The confiscation of the gold was for two reasons. First, FDR was changing the monetary system from one where there was no distinction domestically from internationally. Gold would freely circulate without restriction. Therefore, the confiscation of gold was altering the monetary system moving to a two-tier monetary system with gold only used in international transactions. Consequently, FDR confiscated gold to move to a two-tier system. What FDR then did was confiscate gold. Ironically, this move was intended to target the bankers rather than the public, as the hunt for spare change is now directed at individuals. FDR sought to prevent the bankers from making a profit and to transfer that profit to the state while funding the New Deal. 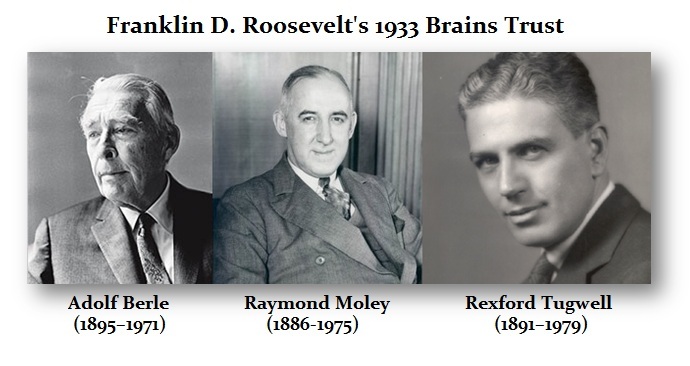 FDR had his Brains Trust composed of lawyers who argued for austerity, exactly as they do in Europe today. They were horrified at such a devaluation because they could not understand money and argued to support the bankers. This is the very same policy of the Troika in Europe today –– screw the people and support the bankers. So the confiscation of gold was NOT a door to door hunt for gold from the people, but it was the confiscation of gold from the bankers who could not hide it. The “good thing” was the end of austerity, which ONLY benefits the bondholders. Today, many pension funds MUST have government bonds. They are going to be seriously hurt unless, they adopt our Solution. You default outright, create inflation to default on real obligations, or you restructure. Government is not ready for restructuring anything until they lose power. 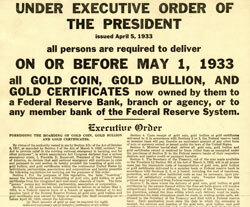 You must separate the confiscation of gold from the devaluation of the dollar in 1934. FDR could have accomplished the same goal by just abandoning the gold standard. However, the bankers would have profited since they could have redeemed deposits with paper, kept all the gold for themselves, and sold it at a higher value overseas. The gold confiscation exempted collector coins and did not hunt door to door, shaking down homes looking for gold. This is not a guarantee that they would not do that today since there is no desire to move to a two-tier system. Today, they are just after money –– period. My advice to FDR would have been the same. The only practicable solution was to adopt a hybrid two-tier monetary system with gold for international trade and paper dollars for domestic use. What most people fail to understand is that traditionally gold coins intended use was for trade, not for domestic circulation. The City of Florence had riots during the 14th century, burning the palaces of the bankers when the silver/gold ratio went nuts because gold was for international accounts and labor was paid with silver domestically. The Mongols used barter internally among themselves, whereas we do see imitation coins of Islamic design to enable trade with the Arab world. The Arabs dominated the West after the 10th century and eventually resulted in the collapse of the Byzantine Empire in 1453. The Islamic world taught the West numbers and math, and the Crusaders took back to Europe the practice of bathing. Following the fall of Rome, bathing was associated with brothels and became evil; numbers were the magic of the devil. Arabs ruled the seas and if the Europeans needed to sail a ship, they needed the Jews to captain it, for they understood that black devil’s magic called math. We find India made imitation Roman coins to enable trade. So two-tier monetary systems are common throughout history. This is what FDR chose by eliminating gold for domestic use and restricting it to settling international trade accounts. The USA issued two types of silver dollars. The “Trade Dollar” was heavier and made to the standard of China to facilitate trade, since they did not accept gold as they were on a silver standard. « What About the Amero?